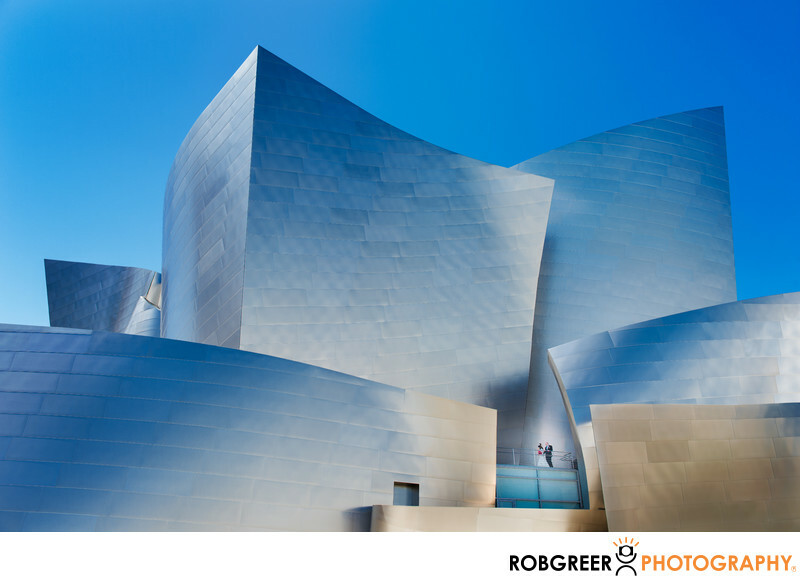 This entry into the 2014 Wedding and Portrait Photographers International (WPPI) 16x20 Print, Album, and Filmmaking Annual Competition was titled "Disney Hall Duo" and is one of three similar photos that entered into the 2014 competition. This image received a Silver award. Let me start by saying that it's not a very good idea to enter similar photos into competition. Judges who recognize similarities between images will typically judge subsequent similar images more harshly. I submitted three similar photographs featuring different subjects into two different categories—two for weddings and one for engagements. I wanted to test a personal theory I had about inconsistencies in judging. This image was the first to appear in a judging room and it received a respectable score of 81 which indicates "good standard of professional skill, creativity and technique." A similar image that appeared in the judging room later in the day scored a 77 indicating an "average professional skill and technique." Even with this small sample, the lesson from this experiment is clear; judges reward the photographer who does it first—not necessarily the one who does it best. 1/250; f/6.3; ISO 400; 31.0 mm.